Make good choices this Halloween…Remember, it’s for the children…. It’s coming and maybe you haven’t done your candy shopping yet. Let me help you by suggesting what you should never hand out…. 1. Wax-paper, wrapped popcorn balls: Are you kidding me? Your house will be pelted with these. 2. Raisins: really… most people raisins unless they are hidden in a cookie. 3. Toothbrushes are not candy. 4. Apples: sure, hand out razor blades, too, and just be done with it. 5. Wrapped hard candies: it’s obvious you emptied your candy bowl. 6. Stickers, see #3 above. 7. Off-brand chocolates from the grocery outlet or dollar store: you don’t eat these, why would you give them to innocent children? 9. Dum Dum lolly pops or other lolly pops: it just looks like you’re the cheapest guy on the block, either that, or you’ve been hoarding candy from the bank all year. Tootsie Pops are perfectly fine, however. 10. Fun size candy if you are only going to hand one one piece. Again, why be the cheapo? Those little gobblins know you are just saving rest for yourself. Thanks to Happy Home Fairy for the photo. She has some great ideas about Halloween Candy on her blog. I know times are really tough. 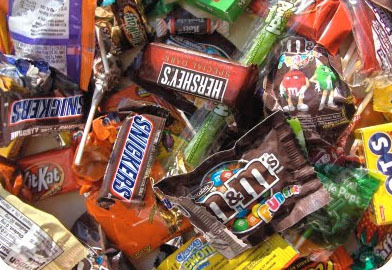 If you can’t afford to buy candy this year, don’t. Just leave the porch light off, or go to a friends house and the two of you can split the cost of the candy. I got a deal on full-size candy bars at Costco this year. With my coupon, it was cheaper than buying a bunch of fun-size bags. I’m going to rock the block this year! “Looks…like you’ve been hoarding candy from the bank all year” that is a most excellent image. Those little plastic rain bonnets that banks used to give out would be a better choice since Dum-Dums are the candy that even people who like candy wont eat.